Most will be aware how weakness in the China construction market has resulted in sharply lower prices for industrial grade export logs from NZ and Australia. At the same time pruned log markets, both export and domestic have held up well. The result is a widening price differential between pruned and unpruned logs. PF Olsen analysis shows that a differential of between NZ$60 and $70 is required to justify the additional cost and volume loss of a pruned regime. The analysis compares the net present value (NPV) of post tax cash flows at a 6.5% discount rate across a range of typical growth sites at variable distances to port. 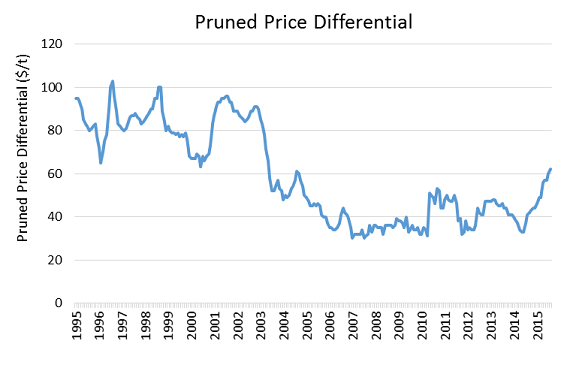 The chart below shows how the price differential between pruned and unpruned logs has varied over time. It is unsurprising that for the last decade interest by forest owners in pruning has been muted. But the chart also shows that market dynamics change. Forest owners are now re-considering the merits of pruning. Source : Agrifax NNI series, P1 vs S1/S2, $/tonne at mill or wharf gate, not adjusted for inflation. Increased use of wood in the built environment in response to the climate change challenge to reduce CO2 emissions and conserve energy. Reducing supply and higher cost of tropical forest timbers – historically the main source of clearwood that pruned Radiata pine can supply into. Continued expansion of the middle class and per-capita use of wood that follows trends of increased discretionary spending. Historically forest owners have always been able to sell a properly pruned log at a premium to an unpruned log price. The reverse has never been true. There is option value in pruning. A wider range, and certainly higher value range, of wood products can be made from pruned logs than from unpruned logs. It is on a good growth site and/or the site is problematic for producing stiff structural lumber. The pruned portion can be accessed and logged independently of adjacent unpruned stands. The forest has both domestic mill and log export options. The site has a low incidence of resin pockets. If reliant on exporting the pruned logs, ground-based logging terrain is preferable so that logs can be debarked and anti-sapstain treated within 48 hours of felling. Pruning is carried out at the right time. That is a time that balances keeping the knotty core small and even, while not taking too much of the green crown off. The margin required to justify pruning is lower for forests that are distant from an export port than for forests close to an export port. Sites that are exposed to drought and/or frequent and strong winds are more likely to produce resinous defects within pruned wood. Heavy levels of resinous defects devalues pruned logs to unpruned log values. Pruning can cause a small temporary decrease in growth and a corresponding temporary (2-3 years) increase (up to 10%) in density. Tools to at least partially mechanise pruning to lower the labour cost. Genetics to minimise the incidence of resinous defects and internal checking. Site mapping for likely moisture stress and wind exposure.